Despite an extensive coordination chemistry, no crystal structures are available for members of the R2P(CH2)nP(O)R2 ligand class. The first member of this class to be structurally characterized is (C6H5)2PCH2CH2P(O)(C6H5)2, which crystallizes in the monoclinic space group, Pn with crystal cell parameters a = 12.752(4) Å, b = 5.6664(17) Å, c = 16.110(5) Å, and β = 110.819(4)o, V = 1088.1(6) Å3, and Z = 2. 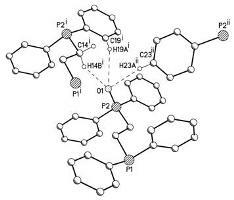 The geometry about the phosphine and phosphoryl moieties bears close resemblance to that of the analogous groups in (C6H5)2PCH2CH2P(C6H5)2 and (C6H5)2P(O)CH2CH2P(O)(C6H5)2, respectively.